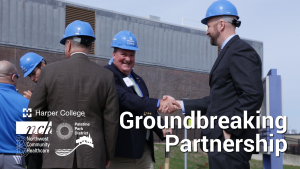 On Monday, April 10, Harper College hosted the groundbreaking ceremony for the new Health and Recreation Center, which is a $38 million renovation and addition to the Wellness and Sports Center (otherwise known as Building M). This project will transform the facility into a leading-edge community health and recreation center for Palatine scheduled to open in fall of 2018. The true community need for this indoor pool was made clear when Dr. Ender began a discussion with Palatine Park District Executive Director Mike Clark back in 2013. After years of discussion, research, and planning, a partnership was formed between Harper College, Northwest Community Healthcare, and Palatine Park District. In the intergovernmental agreement, the Park District will contribute $9 million toward the renovation and once completed pay a portion of the facility operating cost, run indoor pool operations, and offer adult fitness and recreation classes. 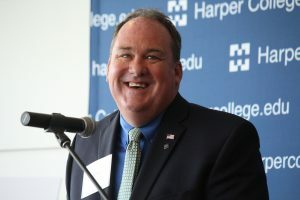 In Mike Clark’s closing remarks, he expressed his excitement for this partnership with Harper College and Northwest Community Healthcare, and that Park District looks forward to much success in providing great memories and opportunities for all residents in both the Harper and Palatine community.